Are you looking to turn up the volume on brunch? Each French inspired recipe is a fun twist on old favorites like crepes and quiche but still provide nourishment via a smart combination of protein and carbs. Don’t forget to serve up a spicy Bloody Mary, a gourmet coffee or your favorite champagne-infused cocktail. Eggs, herbs, ricotta and Parmesan come together in this savory rendition of a crepe. 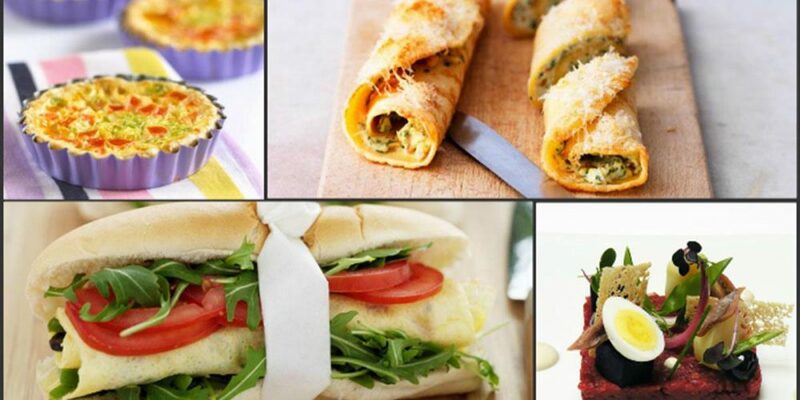 Prepare filling sandwiches with a buttery omelette, fresh greens and tomato slices – all on a crispy baguette. Here is the delicious recipe. Mini quiches make the perfect finger food, especially these ones filled with tasty veggies. If you are a steak-and-eggs type of person you’ll enjoy this upscale French-inspired brunch recipe. What goes great with a mimosa? These delectable quiches made with smoked salmon and artichoke hearts.